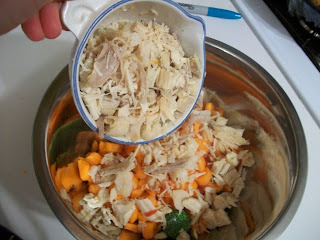 This is a great way to use up some turkey leftovers from the holidays. But don't only make it at the holidays! It's a lovely main course any time, and also great to serve during football games, New Year's day lunch, etc. It also freezes well - freeze before baking, then defrost and bake; or, freeze fully baked if you prefer. The original recipe for this strudel calls for 2 cans of crescent rolls. 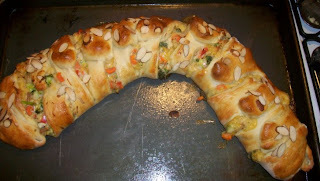 I prefer it using bread dough, which I make in my bread machine. You could also use a loaf of frozen bread dough. 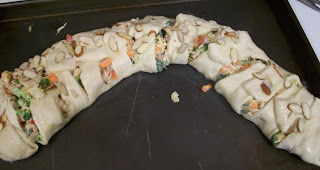 Start by assembling the filling. 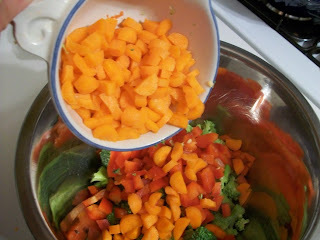 Combine the broccoli, red pepper and carrots in a small mixing bowl. and stir well to combine. Then add the cheese. 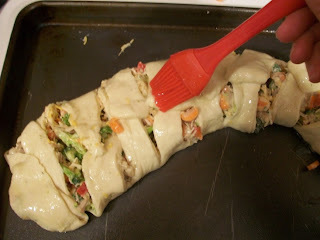 Transfer the dough onto a greased baking pan, then spread the filling down the middle, lengthwise. 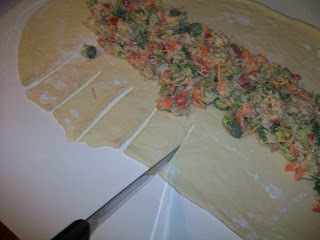 Then cut into the dough at about 1 1/2 intervals on both sides. 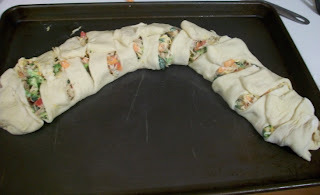 then fold the ends up. Brush the dough with a lightly beaten egg white - this will help the dough become golden. Bake for about 30 minutes or until bread is golden brown and filling is bubbly. Need more ideas for leftover turkey? 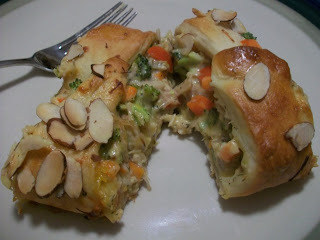 Try Twisted Chicken Tetrazzini, Chicken and Zucchini Pasta, BBQ Chicken Pizza and Mediterranean Casserole. Get more inspiration at the Ultimate Recipe Swap, Tempt my Tummy Tuesday, Tasty Tuesday and Tuesdays at the Table. 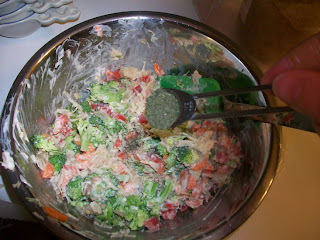 In a bowl, combine the chicken, vegetables, mayonnaise, garlic, dill, salt and pepper. Stir well to combine. Roll out bread dough on lightly floured surface. Transfer to a greased large baking sheet. 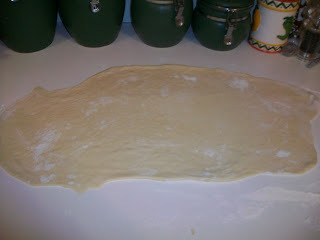 Spoon filling lengthwise down middle of dough. 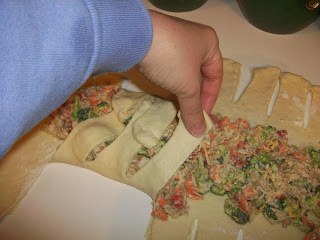 Cut dough into strips from edge to filling, 1 1/2 inches apart, on both sides. Starting at one end, alternate strips, twisting and laying at an angle across filling. Seal ends. Brush dough with egg white; sprinkle with almonds. Bake at 375 for 30-35 minutes or until golden brown. Cut into slices and serve warm. Serves 6-8 as main course; 12 as appetizer. Oh, this looks very, very yummy. I'll be hanging on to this recipe for the next time I do a luncheon. 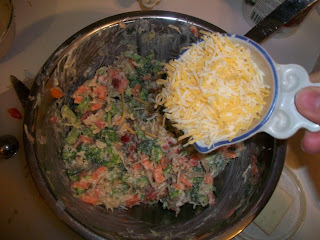 What a great recipe and good way to get those veggies in a meal. Thanks for linking to TMTT.